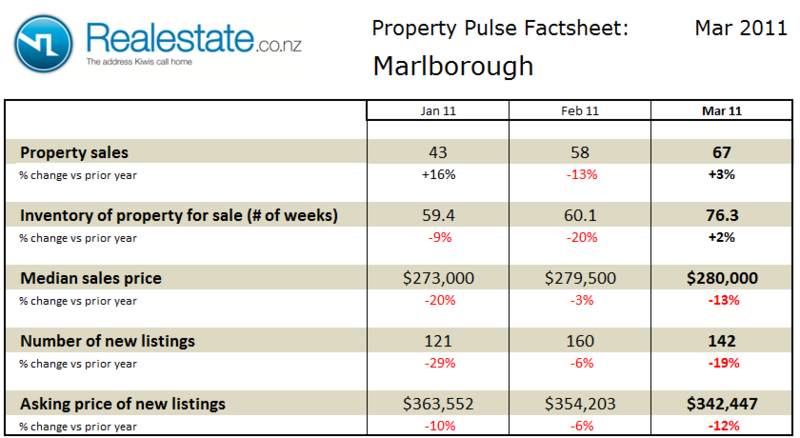 The Marlborough region property pulse factsheet for March 2011 is published using data from Realestate.co.nz and REINZ (Real Estate Institute of NZ). Property sales at 67 in the month rose slightly on a seasonally adjusted basis in March and were up just 3% as compared to a year ago. The inventory of unsold houses rose sharply to remain above the long-term average at 76 weeks of equivalent sales. Median sales price at $280,000 was down 13% as compared to a year ago, but in line with the prior month. The asking price expectation of new listings was also down a significant 12% as compared to a year ago at $342,447. The level of new listings coming onto the market in March at 142 fell as compared to February and was down 19% as compared to a year ago. 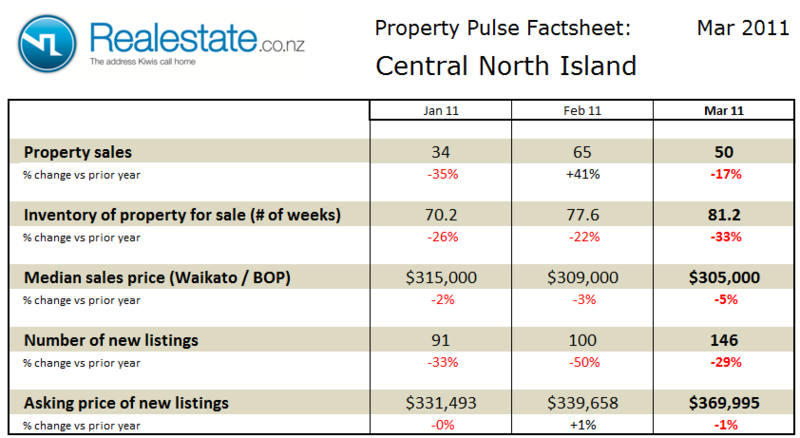 The Central North Island region property pulse factsheet for March 2011 is published using data from Realestate.co.nz and REINZ (Real Estate Institute of NZ). Property sales at 50 in the month fell on a seasonally adjusted basis in March and were down a significant 17% as compared to a year ago. The inventory of unsold houses rose slightly to remain just above the long-term average at 81 weeks of equivalent sales. 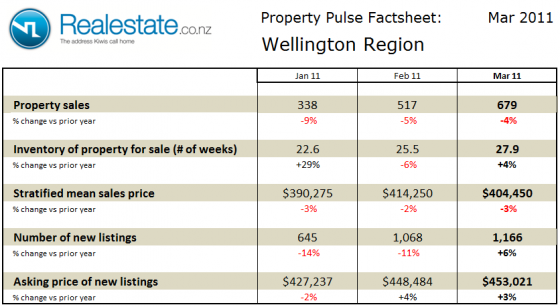 Median sales price for the whole of the Waikato / Bay of Plenty region at $305,000 was down 5% as compared to a year ago and down from the prior 2 months. 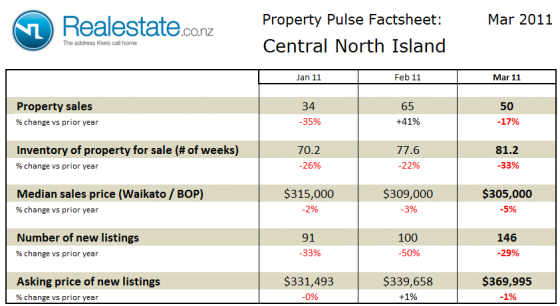 The asking price expectation of new listings in the Central North Island was down just 1% as compared to a year ago at $369,995. The level of new listings coming onto the market in March at 146 was up from February but down 1% as compared to a year ago. 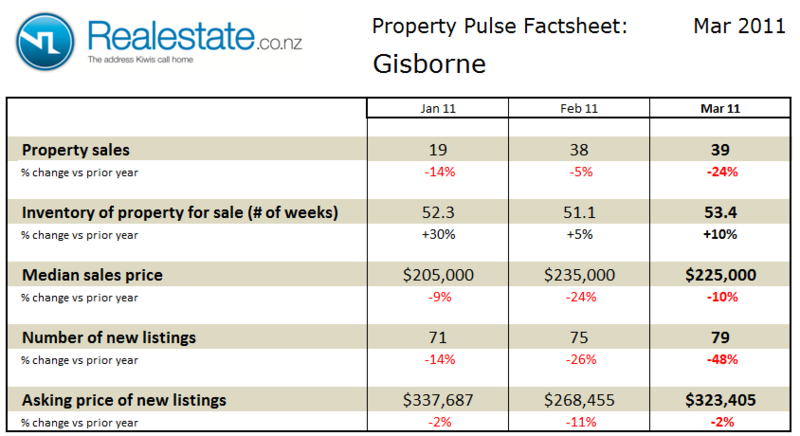 The Gisborne district property pulse factsheet for March 2011 is published using data from Realestate.co.nz and REINZ (Real Estate Institute of NZ). Property sales at 39 in the month fell on a seasonally adjusted basis in March and were down a significant 24% as compared to a year ago. The inventory of unsold houses rose again to remain just above the long-term average at 53 weeks of equivalent sales. Median sales price at $225,000 was down 10% as compared to a year ago and down from the prior month. The asking price expectation of new listings was down just 2% as compared to a year ago at $323,405. The level of new listings coming onto the market in March at 79 was marginally up from February but down a very significant 48% as compared to a year ago. 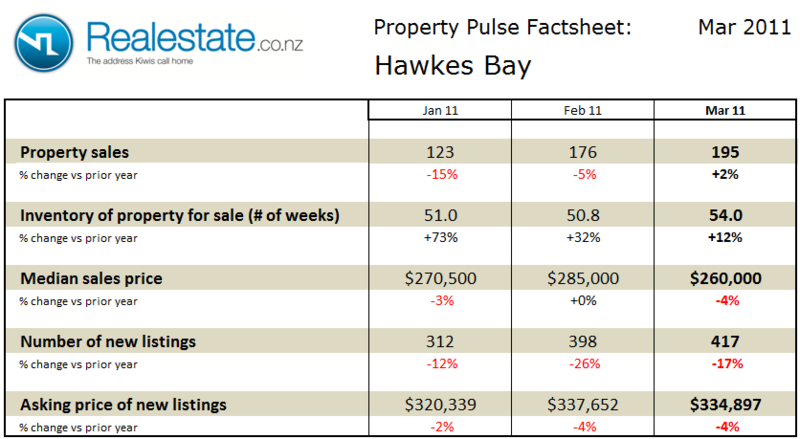 The Hawkes Bay region property pulse factsheet for March 2011 is published using data from Realestate.co.nz and REINZ (Real Estate Institute of NZ). Property sales at 195 in the month barely moved on a seasonally adjusted basis in March but were up slightly by 2% as compared to a year ago. The inventory of unsold houses rose again to remain well above the long-term average at 54 weeks of equivalent sales. Median sales price at $260,000 was down 4% as compared to a year ago and down from the prior month. The asking price expectation of new listings was down just 4% as compared to a year ago at $334,897. The level of new listings coming onto the market in March at 417 was marginally up from February but down a significant 17% as compared to a year ago. 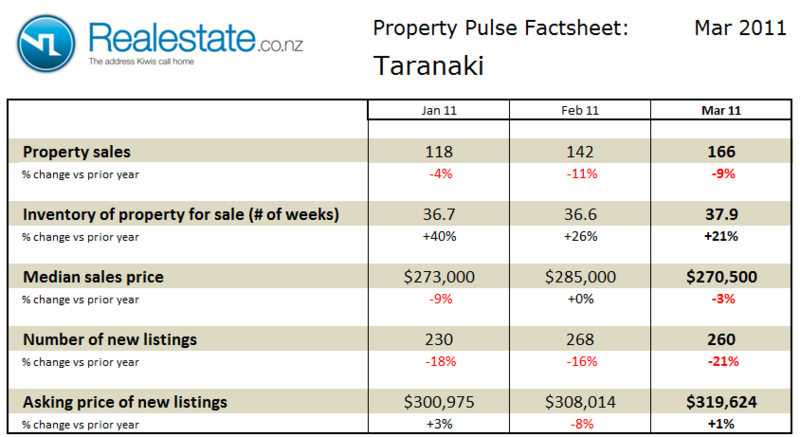 The Taranaki region property pulse factsheet for March 2011 is published using data from Realestate.co.nz and REINZ (Real Estate Institute of NZ). Property sales at 166 in the month barely moved on a seasonally adjusted basis in March but were down by 9% as compared to a year ago. The inventory of unsold houses rose again to remain well above the long-term average at 38 weeks of equivalent sales. Median sales price at $270,500 was down 3% as compared to a year ago and down from the prior month. The asking price expectation of new listings was up very slightly by 1% as compared to a year ago at $319,624. The level of new listings coming onto the market in March at 260 was marginally down from February and down a significant 21% as compared to a year ago. 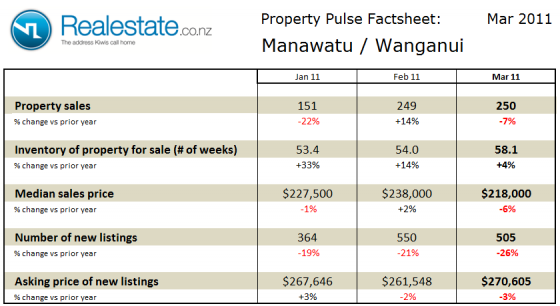 The Manawatu / Wanganui region property pulse factsheet for March 2011 is published using data from Realestate.co.nz and REINZ (Real Estate Institute of NZ). Property sales at 250 in the month fell on a seasonally adjusted basis in March and were down by 7% as compared to a year ago. The inventory of unsold houses rose again to remain well above the long-term average at 58 weeks of equivalent sales. Median sales price at $218,000 was down 6% as compared to a year ago and down from the prior month. The asking price expectation of new listings was down slightly by 3% as compared to a year ago at $270,605. The level of new listings coming onto the market in March at 505 was down from February and down a significant 26% as compared to a year ago. 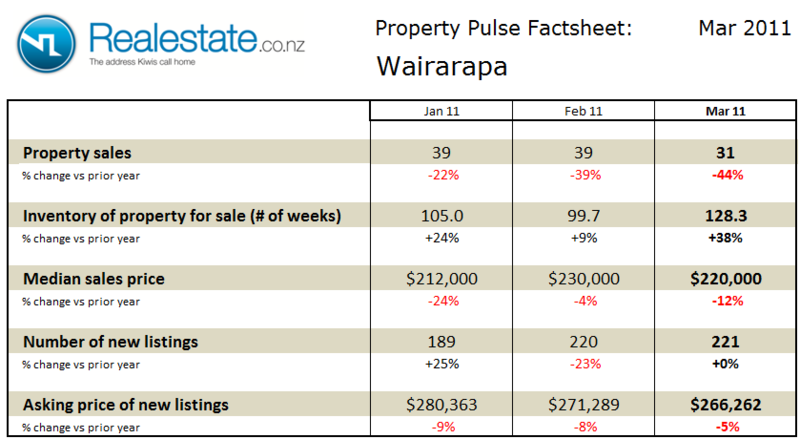 The Wairarapa district property pulse factsheet for March 2011 is published using data from Realestate.co.nz and REINZ (Real Estate Institute of NZ). Property sales at 31 in the month fell on a seasonally adjusted basis in March and were down a very significant 44% as compared to a year ago. The inventory of unsold houses rose sharply to remain well above the long-term average at 128 weeks of equivalent sales. Median sales price at $220,000 was down 12% as compared to a year ago and down from the prior month. The asking price expectation of new listings was also down by 5% as compared to a year ago at $266,262. The level of new listings coming onto the market in March at 221 was flat as compared to February and also as compared to a year ago. 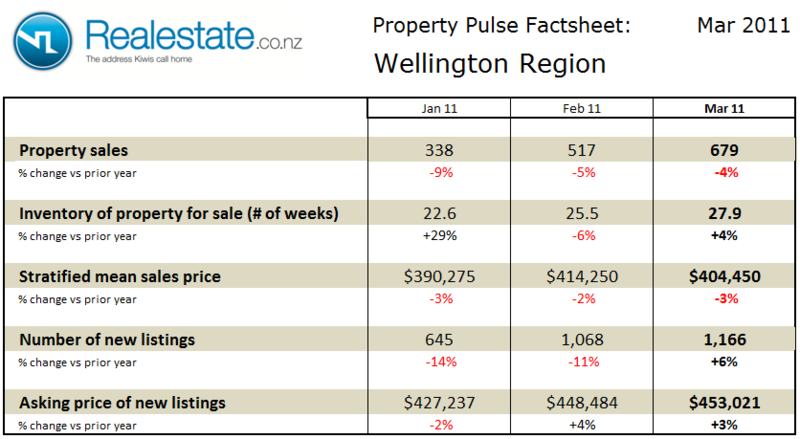 The Wellington region property pulse factsheet for March 2011 is published using data from Realestate.co.nz and REINZ (Real Estate Institute of NZ). Property sales at 679 in the month rose on a seasonally adjusted basis in March but were down very slightly by 4% as compared to a year ago. The inventory of unsold houses rose again to remain above the long-term average at 28 weeks of equivalent sales. The stratified mean sales price at $404,450 was down 3% as compared to a year ago and down from the prior month. The asking price expectation of new listings was up slightly by 3% as compared to a year ago at $453,021. The level of new listings coming onto the market in March at 1,166 was up slightly as compared to February and up 6% as compared to a year ago. The Property Market Pulse report provides a set of factsheets for each of the 19 regions of the country consolidating the latest data from key sources in the real restate market. From the Real Estate Institute (REINZ) comes the latest sales numbers for September as well as the median sales price for key regions and the stratified sales price for key centers. From the Realestate.co.nz comprehensive database of listings comes the key measure of inventory of unsold properties on the market. 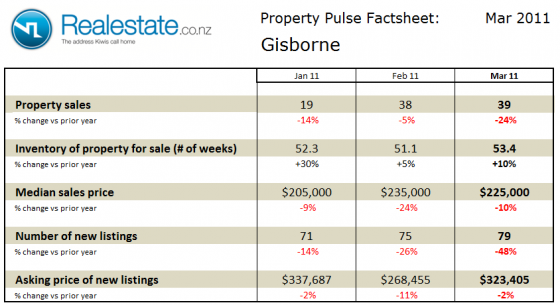 The number of property sales is a key measure of buyer activity. The Real Estate Institute release this data on a monthly basis from the sales made by all licensed agents in the prior month making this data the most timely and comprehensive. Actual monthly sales data is effected by seasonal factors, for this reason seasonally adjusted data is presented which clearly shows one month to the next if the sales are going up or down. Sales in September totaled 4,323. On a seasonally adjusted basis as presented in the chart above the sales were up just 0.6% on August. As compared to September 2009 this month’s sales represent a fall of 33%. The level of sales in the calendar year to date reflect closely the sales levels of 2008 rather than 2009. In the first 9 months of 2008 sales totaled 43,131; in 2009 they totaled 52,394 and in this current year the total is 42,630. As is highlighted in the regional reports the impact of the Canterbury earthquake significantly impacted not just that region but the national numbers. 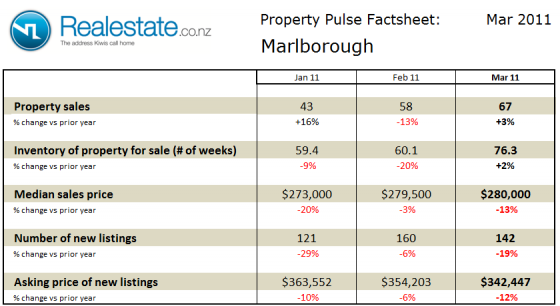 The Canterbury sales impact probably amounted to around a 5% decline on a national basis as the region itself suffered a close to 40% decline. The selling price of properties measures that critical balance between what a buyer is prepared to pay and what a seller is prepared to accept. The Real Estate Institute data of prior month sales produces a median price. This raw number is then re-calculated through a model developed in partnership with the Reserve Bank of NZ to create a Stratified Price, which ensures that volume changes in key price segments do not skew the figures. The stratified price fell in September at $359,555 reflects a marginal change on August when the price level was $360,675. The level of sales price using this accurate stratified method has been without any great volatility for the majority of this year after recovering from the market lows of 2009. At this current level it represents a 5.6% fall from the peak of the market back in November 2007. 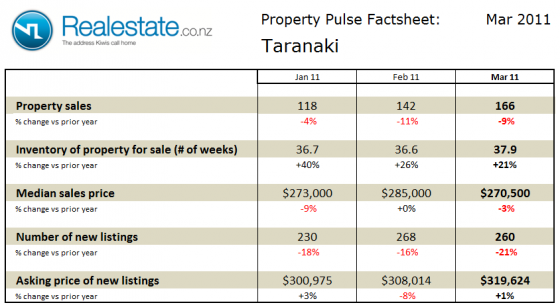 The number of properties on the month is provided from Realestate.co.nz data and measures the level of seller activity in the market. 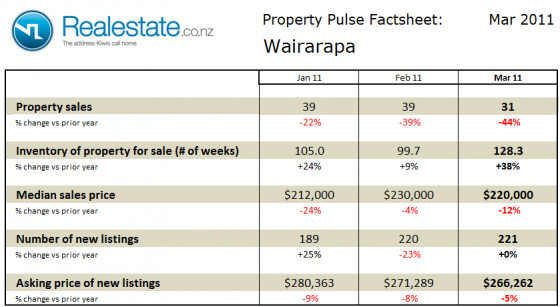 The data represents the total number of new listings coming onto the market each month and is compiled at the start of each month for the prior month and is published in the NZ Property Report. The measure of properties on the market is represented by the number of weeks of equivalent sales, and judged on a comparative basis with prior months more accurately reflects the state of the market. The level of inventory of properties on the market measured in equivalent weeks of sale picked up slightly in September. It now stands at 47 weeks as compared to 46 weeks in August and compares to 32 weeks in September last year. The long term average is around 38 weeks which would indicate that the market is still very much in favour of buyers rather than sellers. These statistics are the aggregation of all the statistics from across the country. As is well know by those in the industry, real estate is a local business and in an attempt to provide greater insight into the local market the same set of key data – sales, selling price and inventory has been calculated for each of the 19 regions of the country. Check out the factsheet for your local region to see what is happening in your neck of the woods. The Hawkes Bay district Property Market factsheet can be downloaded by clicking this icon. 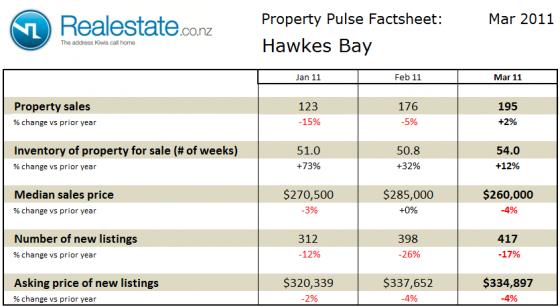 Property prices in the Hawkes Bay fell slightly in September to $265,000. The current price is exactly as in September 2009. Property sales in the region picked up in September by 14.1 % on seasonally adjusted basis. A total of 159 properties were sold in the region in September. 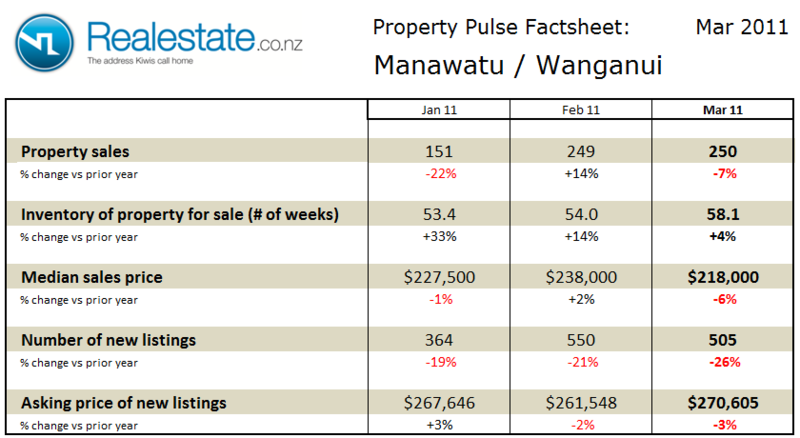 Over the first 9 months of 2010 a total of 1,503 properties have been sold compared to 1,945 in the same period of 2009. Inventory of houses on the market rose slightly in September with 50 weeks of equivalent sales on the market. This inventory level continues to be above the long term average of 35 weeks. This would indicate that the market still swings in favour of buyers.